Elizabeth Delano is the mother of Anne Mary Delano. Anne Mary, now 32 years old, has Down Syndrome. She started her journey with HeartShare when she entered HeartShare’s Early Childhood Services Program. She went to a HeartShare First Step Pre-School. For the employees there, Anne Mary’s happiness was as important as her development. “The speech therapists felt that teaching Anne Mary some sign language was the way to go since she had no interest in any type of communication device,” shared Elizabeth. The speech therapists were not only considering how to teach Anne, but also how Anne wanted to learn. “They were kind, caring, and so knowledgeable on how to best care for the families seeking their assistance,” Elizabeth said about the First Step team. When Anne transitioned to public school, HeartShare was still there for her and her family. Through HeartShare’s Family Support Services, Anne participated in “Heels and Wheels” Saturday respite. This Respite/Recreation Program gave her the opportunity to go to movies, bowling, museums, and more. “She would always come home with a smile on her face,” said Elizabeth. HeartShare’s concern for Anne’s safety did not stop them from finding the right placement for her. “HeartShare started looking for another site and was finally successful after a long, hard search,” shared Elizabeth. HeartShare also tries to bring the right program participants together. Anne Mary lives with her close friend Alexandra at the Caruana II Residence. “Anne and Ally had been friends since they were enrolled in the early intervention program at HeartShare. 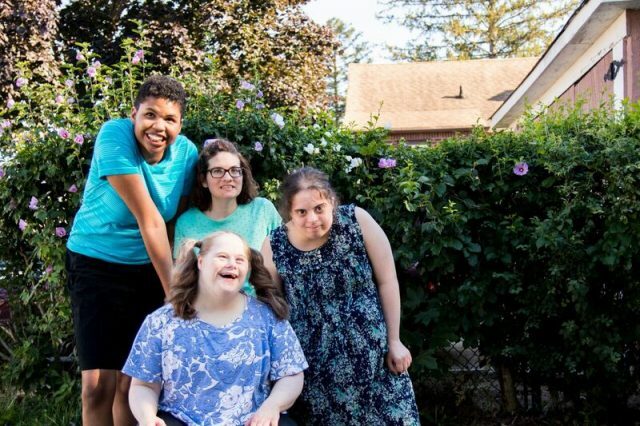 The residential team worked hard to find the right candidates to fill the other two beds, and soon Laura and Sade were the new roommates,” said Anne’s mother. The Direct Support Professionals (DSPs) hired to work with Anne and the other women at the Caruana II Residence also go above and beyond. “They are professional and competent, and understand each woman’s personality, and their needs. They even enjoy a good dance party now and then. Whenever I visit Anne, I can see how well she is cared for,” said Elizabeth. The DSPs take the time to get to know each participant. From childhood to young adulthood, HeartShare has been there every step of the way.